Intel Play was a line of advanced toys developed by toy maker Mattel and chip maker Intel. According to a press release, the toy line would combine "the power of PCs and the 'magic' of toys into a new generation of interactive play". 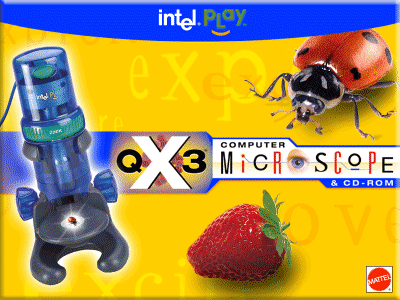 The line was announced on February 3, 1999, initially consisting of two toys that were both PC peripherals: the X3 Microscope and the Me2Cam, a microscope and webcam, respectively. The brand identity for this toy line was developed by Sapient, one of the hottest marketing consultancies in the dot-com era. It included a friendly "Play" logotype and a special version of Intel's trademark audio logo. Leveraging the tech-oriented Intel brand to market a line of toys is a curious strategic choice. Presumably, the Intel brand gave the toys some credibility to parents as having educational value. Microsoft had launched a similar PC-related toy called ActiMates a few years earlier. Scattered press reports suggests the Intel Play products were well reviewed, but they didn't succeed financially and the brand was retired around 2002. According to David E. Carter's American Corporate Identity 2001, this logo was designed by Karin Bryant. The more well-known graphic designer Clement Mok was employed by Sapient at this time, and the Intel Play logo was included in what looks like his portfolio, but I'm uncertain about his involvement. The opening setup screen for QX3 microscope. The logo with reversed colours.